In 2E 576, Euraxia Tharn of House Tharn became Queen of Rimmen in an event known as the Frostfall Coup. By 2E 582, as the Three Banners War and Planemeld caused upheaval across Tamriel, the city had become the home of the Jovial Lambasters, who were known to worship Clavicus Vile. Sometime later, when remnants of the Kamal army that had instigated the Second Akaviri Invasion of 2E 572 resurfaced and usurped Attrebus' successors, the Akaviri of Rimmen joined the Kamal in an ill-fated bid to restore the Second Empire. The Khajiit took advantage of the chaos to unsuccessfully attempt to reclaim the rim territories. 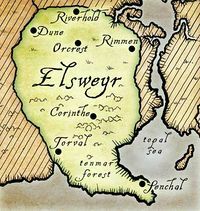 Rimmen seceded from Elsweyr in 2E 812 and formed the Kingdom of Rimmen. After the ascension of Tiber Septim as Emperor of Cyrodiil in 2E 854, Rimmen agreed to renew tribute to the Mane of Elsweyr in return for protection. However, the city had been annexed by the Cyrodilic Empire by 2E 896, when the gigantic brass golem Numidium was reassembled and activated there by Tiber Septim. Ya'Tirrje, the Gold-Cat, ran a prosperous drug smuggling operation in the city in the late Third Era. During the Imperial Simulacrum, the city was ruled by King Ommed and rivaled Alabaster. Rimmen lends its name to an alcoholic beverage known as Rimmen Sour Bock.